It slowly dawns on him that this is not what he expected. All the stories about a ‘blinding white light’ or ‘a stifling darkness’ are nothing like what he is experiencing. He does not know what to think – but I can see the thoughts flying into his brain a mile a minute. He looks around him at the deep darkness and wonders why he cannot see anything but sees himself clearly. He looks at his wrists, tension lines tightening around his eyes in preparation of what he expects to see – but doesn’t. A blank look comes into his eyes, and he looks again at his wrists – looking like Keanu Reeves in the Matrix trying to make sense of reality. And then I see the acceptance of the inevitability in his eyes. He is ‘dead’ after all. “You just missed all the possibilities,” I say to him, but I speak it like a thought. I see a frown gather between his line-riddled thirty-two year old brow. “What possibilities?” he mumbles in response. As though in response, his surroundings change and suddenly he’s standing in the pharmacy from which he’d bought some things. Its doors are closed but the girl is still inside sorting out some accounting. There’s another girl looking on, dressed in mismatched colors. Her hair is the color of ash. I see the confused look on his face, he’s about to ask an irrelevant question. “So what are you doing?” Ash-girl asks the attendant who is taking some money from her purse and adding it to the stacks of notes on the table. He looks startled and I see the thought. Boyfriend? Then the next one. What does that have to do with me? The girl shrugs and continues doing what she’s doing. His surroundings change again – and this time it’s a place he recognizes. Anger flashes in his eyes, but this time he says nothing. It is a sitting room – a fairly comfortable sitting room. A graying man wearing traditional buba and sokoto and a girl in her late twenties sit in front of a TV, grinning at the screen and each other. I can’t see his face, but the resemblance between him and the man is striking. The man might as well as have spat him out. A woman; a woman that looks like an older Joke Silva walks in the sitting room and sits between the man and girl. The man puts his arm around her and she leans her head against his shoulder. The answer comes – surprisingly, from the graying man. “You know, I’m worried about Yomi,” he says. I feel rather than see the shudder come from him – from Yomi. He is shocked. “I am too o,” the woman answers in a sing-song voice. “The last time he was home –“ she shakes her head as though to evict the thoughts. “He was so angry…” her voice trails off. “You know you weren’t nice to him,” she tells the man beside her gently. The man looks like he wants to say something while the girl gently stands up and leaves the room. And then the man’s shoulders sag. “Maybe I wasn’t too understanding…” His voice trails off. The woman kisses him softly. “That’s why I love you dear,” she cuddles even closer to him. “We’ll talk to him tomorrow,” she finishes. Yomi trembles like a leave tossed in the wind. I see his fists clench and unclench. He tries to speak – but something is stuck in his throat. “But I’m dead…” he finally croaks. “I’m dead, right?” he says to no one in particular. He moves again. There’s one more thing he needs to see. Close my eyes and keep the dream alive. now we offer you this: our entire might! I mutter ‘here we go again’ under my fresh minty breath. ‘Fresh minty’ because I approach my work with dedication – something similar to the way a surgeon approaches a dissection. It is not a joke – because within the pages are words; words, silent testimonies to someone’s life. A note, a grain of sand, a monument to mark his passing, graffiti; an ‘I was here’ on the wall of time. And I do not take that lightly. So I take a bath, scrub myself thoroughly to some Casting Crowns or Newsboys, and then wear my Sunday’s best, douse myself in perfume, spray some breath spray in my mouth (duh), and take the stage (actually, sit in front of my system is more like it). And then I attempt the near-impossible; wear the author’s shoes. 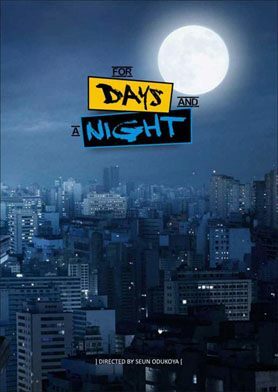 In this case, the author would be Su’Eddie Agama, a poet and writer who has been around for a while. His freshly-ground collection, Bring Our Casket Home is the book that lies on my metal table for dissection. It’s almost impossible to not dream along with Su as he takes you on a sojourn in word and rhyme. As I try to see what he saw that birthed those lines, at times I put the book down and go ‘hmmm’ (which is a huge deal actually; me doing ‘hmmm’) at times I burst out in laughter. It is truly a master’s piece. 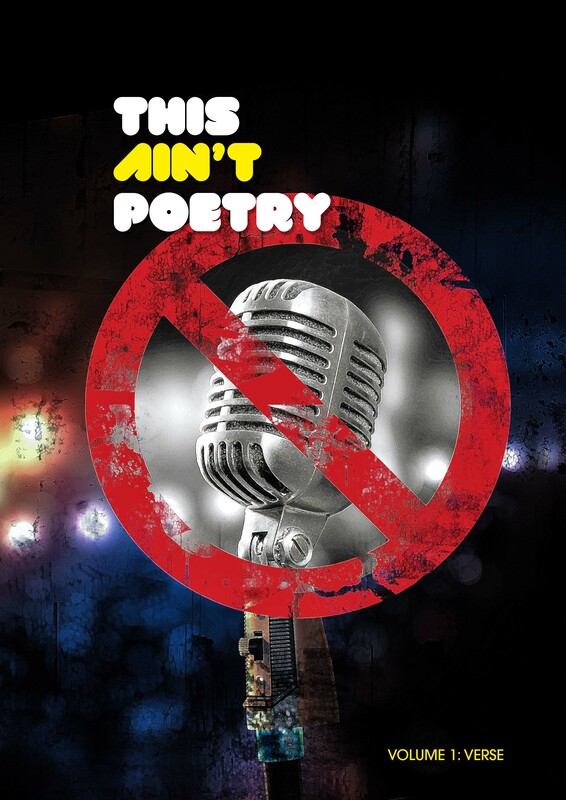 My favorite piece is easily ‘Silence Shouts His Message Clear’ a rousing sonnet that delivers with every line. A lot of the pieces speak quietly – like the simple ‘The Teacher Called The Count’ and the riveting ‘Shallow Hollow’. The only ‘slow’ point came with ‘New Year Tales of Subsidy’ a mild protestant piece that sticks out like a bump on a baby’s forehead. Even then, Su’ pulls it off with a smooth delivery that manages to convince. 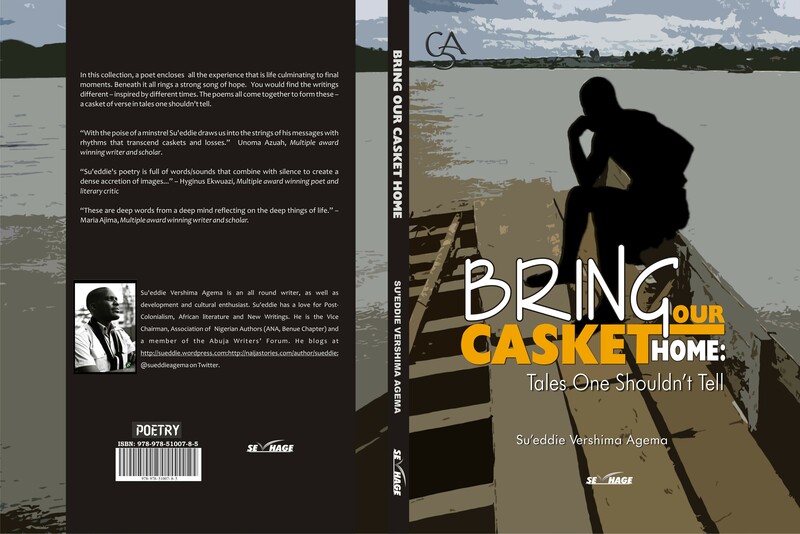 But much more bigger than Su’, than ‘Bring Our Casket Home’ is the realization that poetry; in Nigeria is speaking out with a strident; insistent voice. That might also be as result of the NLNG prize for this year being about poetry; but whatever the case, I like that people like me have more options! Only last week did Iquo release her debut, and now Su’?! I encourage you to add ‘Bring Our Casket Home’ to your reading lists. Get the book. GET. IT. It is available wherever books are sold. To enjoy more of Su’s work, find him here. Imagine feeling as lonely as a needle in a haystack. That’s an odd simile, right? Yet, that’s the only way I feel I can describe it; or come close to describing it. It was not a good feeling. Anyways, so there I was. I had been going through a rough patch; I mean rough. Days of no meals, weeks of not having more than a hundred naira in my pockets. I mean, that would be okay if I was a teenager or some child who was in pe-school or…or something. No. I was thirty-two years, a couple months and some days that night. This meant that I should be my own man or something close to that. Which meant I could not run to my parents to ask for some money…or even ask for a loan? That would be a few meters past stupid, right up the alley of downright moronic. Borrow money to…to eat? And of course, I was fast learning just how alone I was on this planet. Somewhere down this road my model wife had disappeared without an explanation. She had just upped and left. Now, to be fair to her she did just about everything that could be expected of her but…she was just a human being. So she got to that ‘make-or-break’ point everybody has, and I guess she broke. I had just found out the definition of that one too. Suddenly I had become a pariah; someone who was no good to hang around. And you know how the saying goes; out of sight, out of mind. I simply had no one. None. 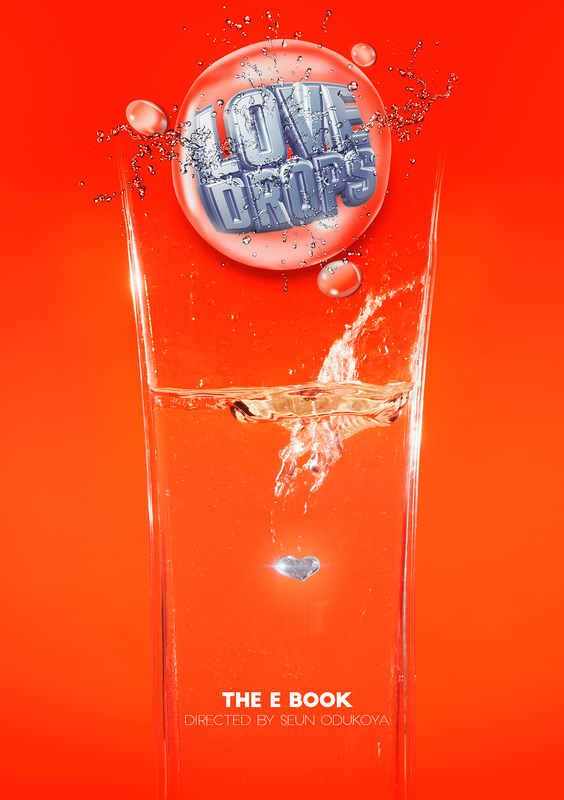 I couldn’t share my frustrations; helplessness, pain…I kept it all bottled inside. There I sat in my one room apartment, staring at the white walls. I was without prospects, without a hope, without expectations – nothing. As far as those words were concerned I was good as dead. With nothing else to do I began to question every decision I had taken. One of those ones that rankled the most was that I had turned down a two-fifty thousand naira job less than four months back, simply because that was not what I wanted to do with my life. It had been a hard decision even then, but the main reason I had been able to stick it was because I felt I was onto something good. I had a plan; worst case scenario I would be working on a television series that would net me a minimum of half a million per season. But I also learnt in a hurry; plans that relied on other human beings were not plans at all. I learnt that the worst way possible. I missed my wife. I missed Lara. I kept rubbing my palms together as though something was bound to materialize within them. Stopping for a small second I looked at the palms; the hands themselves and wondered why it was so hard to build something with them. As I sat there; my gaze fell on the arteries and I idly began to entertain thoughts of suicide. It started as a mere thought, but the more I thought about it the more it began to look like the only way out. As far as the rest of the world was concerned I was dead anyway, so why not? Now that I look back over it, I realise that I was just stuck in self-pity mode. I needed something or someone to get me out of that phase, but sometimes the easiest available thing was the hardest to find. I did try to fight it; tried to give myself reasons not to do it. I just could not find one. So…I stood up and walked out of the house. My first destination was the local pharmacy where there was this girl who would frown heavily whenever I came there with my wife but would smile brightly if I was by myself. She gave me such a smile now, but it made no more difference to me than water would have made to a duck. Still I smiled back tiredly and told her I needed several pills of phenobarbitone; but that I was hard up for cash and so I would get back to her. She was a bit too happy to oblige. After that, I went to the aboki next door to me and got a bottle of Schnapps also on credit. It did occur to me that I could have gotten something to eat the same way, but I never was comfortable with buying things like that. I did not like it. But since I had made up my mind on what to do…I just went and did it. Back home, I switched off my phone; the phone that had not rang for a bit over three weeks, as I dug through my CD stash for my favorite record. I might as well have a ball of it, I thought to myself. My home theatre had been acting up for a while now, but for some reason I was convinced it would work tonight – and it did. So, listening to some choice Bach and Chopin, I set the stage, ready to end my life. First thing I did was to get the sharpest thing I could find which happened to be my Gillette razor. I broke it open and extracted one of the blades. And then I looked through what was left of my medicine cupboard and picked out the Actifed bottle. There were still a number of pills in it. Carrying it over to the table, I stripped down to my boxers and then I wore my favorite clothes; a black Green Lantern T-shirt that was a gift from my wife, blue Live Mechanic jeans – things that had no meaning for me anymore. I was ready to go. Breaking open the seal of the Schnapps I took a large gulp that brought tears to my eyes and emptied half of the bottle. Before I began to feel the effects, I swallowed four Actifed pills, followed immediately with all the Phenobarb pills I had gotten; six. And then I sat back. Slowly, that pleasant lethargic feeling that came with an overdose began to steal over me, but that was not the goal. That was to be my anesthetic. Moving slowly, I grabbed the razor and, with manic strength cut through my right wrist severing the artery and several veins at the same time. There was a huge gout of blood, spraying the walls with bright red. I felt some pain…but due to my inebriated state it was from a distance. It did not hurt that much. I sat down there and watched my life blood drain away, wondering how something that looked so watery could keep a human being alive. There was so much of it. I began to feel dizzy; white spots decorating my vision. By then the blood had stopped spraying and instead was steadily pumping from my open wrist. I tried to stand up but lost my balance and fell across the bed. And just like that, I was dead. It was finally over. And not just because I write it, but because well-written poetry can do so much with so little. They say ‘a picture is worth a thousand words’ I say ‘one well-crafted piece is worth a million pictures’. Without further ado, peep the debut of author, performing artist, writer and friend Iquo DianaAbasi Eke (she wrote the above piece too! 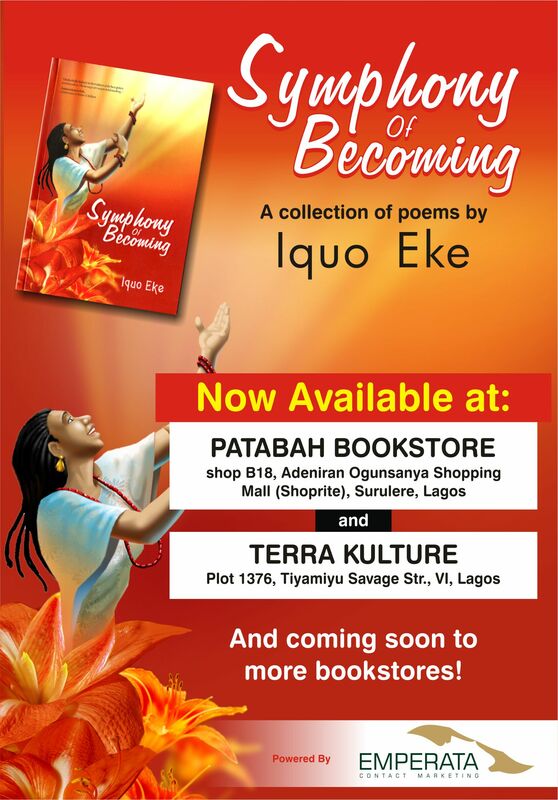 ); Symphony Of Becoming – A Collection of Lines (that’s what I choose to call it) now available at a bookshop near you. Diana Eke presents – NOW AVAILABLE! 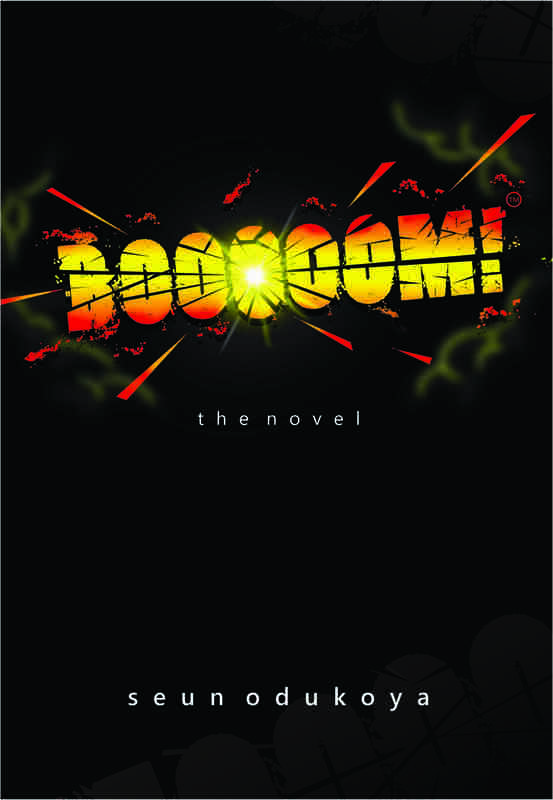 Coming soon to Amazon, Kindle, iTunes and wherever books are sold. I suggest you do yourself and your collection a world of good – and add this to your literary (and even real) life. Innocent woke up screaming and kicking like a drowning man. It seemed to him that he had been having the worst nightmare of his life. But he woke up, and the nightmare continued. The woman, now wearing blue jeans and a black blouse was sitting on a chair watching him. The moment he came fully awake, she jumped up and looked at him in fear. Innocent shook his head. Looking around him for the clothes he had discarded earlier, he started to wear them slowly. When he was fully dressed, he took his keys and phone from the bedside table and dumped them in his pocket. Then he picked up the toothbrush he’d dropped earlier and placed it on the bedside table in front of the picture, the picture whose glass he had smashed. He did not look up till he was done, and even then he did not look at the woman. Innocent did not answer, walking slowly towards the main door instead. When he got there, he pulled out a bunch of keys and easily opened the door. He stood at the door and regarded her with calm coldness. Innocent looked towards the direction the voice was coming from and spotted a portly man wielding a wooden cane walking towards him. It was his landlord of course – except there was no indication that the man had seen him before. He automatically started backing away, realizing how awkward it would be telling the man the same story he had just been telling Henrietta. He mumbled something about ‘wrong address’ and slowly made his way towards the gate a few meters away. Not waiting to see what the landlord’s reaction would be, Innocent broke into a run. He actually took a moment to appreciate the joke of his situation; running for his life from his house – or at least the house he paid rent for, before he flew at the gate full speed. That was as far as he got before the truck smashed into him.